The Mustangs repeated as PSL champions as Adoreya Williams scored 18 points and Tiara Earnest had 17 points, five rebounds and five steals. Shanea Dinwiddie had five points and Jaquoia Jackson, Sequoia Jackson, Coreen Yharborugh, and Ajanee Horton each had four points in the championship game. Detroit Mumford -- 2019 PSL girls basketball champions. Adoreya Williams led the Mustangs with 15 points and six steals. Shanea Dinwiddie had 14 points and five rebounds. Ajanee Horton added 11 points and seven rebounds and Tiara Earnest had 10 points and nine rebounds in the victory. Shannon Wheeler led the Phoenix with 12 points and nine rebounds. Erica Martin led the Crusaders with 18 points and 11 rebounds. Del'Janne Williams had 16 points, five rebounds, five assists, and five steals. Monica Williams scored 10 points and Danielle Camp added seven points in the victory. Jayla Smith had 18 points and 10 rebounds for the Bulldogs. Detroit Martin Luther King's Del'Janne Williams scores against Detroit East English on Monday. Detroit Mumford's Adoreya Williams (10) drives to the basket against Detroit Renaissance. Tiara Earnest led the Mustangs with 23 points, eight rebounds, and two steals. Shanea Dinwiddie had 12 points and seven rebounds in the victory. Jaquoia Jackson and Sequoia Jackson both added five points. Audrianna Hill scored 15 points to lead the Phoenix. Kailee Davis had 13 points five assists and six steals. Mikyah Finley added nine points and Taylor Anderson had eight points in the win. Erica Martin led the Crusaders with 15 points and 12 rebounds. Monica Williams had 13 points and five assists. Del'Janne Williams had 11 points and Charelle Mathis added eight points. Jayla Smith led the Bulldogs with 19 points and 14 rebounds. Alexis Thompson had 14 points and eight rebounds. Kendal Taylor added 12 points, five rebounds, and seven assists. Keyonna Johnson had 12 points and nine rebounds to lead the Technicians. Raven Jackson scored 22 and Alexis Crawford 15 for the Panthers. Mikyah Finley scored 11 and Ajanee Hutson 10 for the Phoenix. Kiara McGowan finished with 16 points, 11 steals and six assists; Chloe Williams added 16 points and Talia Jones 15 for the Comets. Alexis Thompson had 25 points and 12 rebounds, Jayla Smith had 18 points and 10 assists and Arie Austin scored 10 for the Bulldogs. Detroit West Side Academy's Sancia Johnson scores against Detroit Denby on Monday. Detroit Western International's Egypt Fuller races down court against Detroit Osborn on Monday. Detroit East English's Alexis Thompson (2) drives to the basket against Detroit Western on Friday. Detroit Martin Luther King's Monica Williams (35) scores against Detroit Cody on Friday. Detroit Renaissance's Audrianna Hill (22) scores against Detroit West Side on Friday. Sophomore Taylor Booker scored 13 points and freshman Kyra Lawarence added 11 to lead the Phoenix to the junior varsity championship. 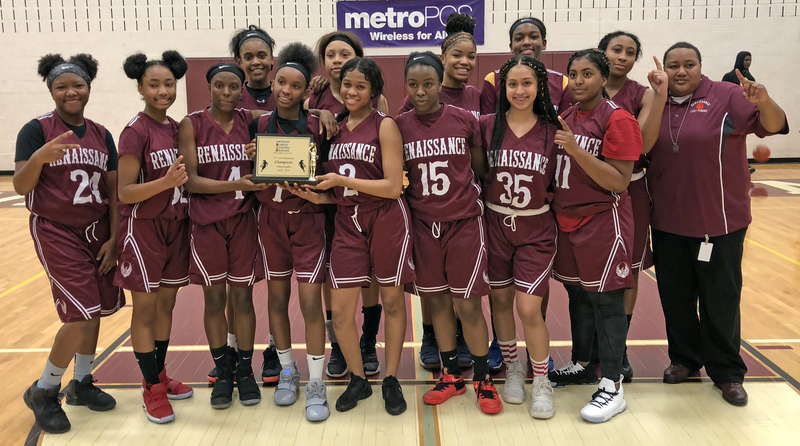 Detroit Renaissance players and head coach Nicole Blocker pose with their PSL junior varsity championship trophy on Thursday.